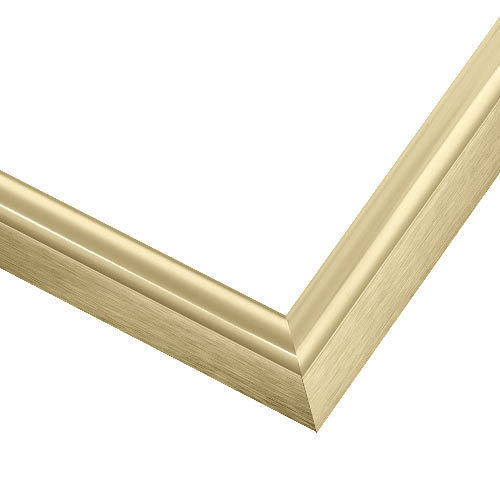 A metal frame in a narrow, round profile and soft gold finish. Perfect for any work of art, this versatile, gold frame is simple, classic and gallery-ready. What is the rabbet size? Tha rabbet of this frame is 5/8". If you have any additional questions do not hesitate to contact our friendly framing experts at 1-800-332-8884 or via LIVE chat Monday - Friday. 5/8 inch ... sorry so late with the answer. I would like to frame a silk scarf and sew it to the top of matting board so that the rolled edges show rather than tucking the scarf hem under the cut matt. When I have selected the frame size and am prompted to chose the single matt option it requires that I choose a width. Is there an option to have the whole matt board sent only cut to fit the frame with no center cut out? Thank you for your inquiry. For specialty orders such as this, you would need to contact our customer care team. They are available Monday through Friday at 1-800-332-8884. They will be happy to work with you on exactly what you need. We look forward to hearing from you soon!